The general street layout in Washington was similar back in 1945 but a few street improvements have been made since then. The Roosevelt Bridge has been added and additional bridging connecting to 14th Street. A number of underpasses under some of the more congested circles were built. There were some grand plans for freeway construction that were partially completed but eventually blocked. Most of the highway improvements since 1945 were made on roads connecting to Virginia. There was some freeway construction on routes connecting to Prince Georges county. The only similarity to freeway construction built to Montgomery County was the Clara Barton Parkway. What the map doesn't show you is the route the trolleys took around Dupont Circle. A family with some influence living on the eastern side of Dupont Circle persuaded the authorities to keep both directions of the trolley line along Connecticut Avenue on the west side of the circle. Strangers to the area must have been surprised to see the northbound trolleys going backwards around the circle. 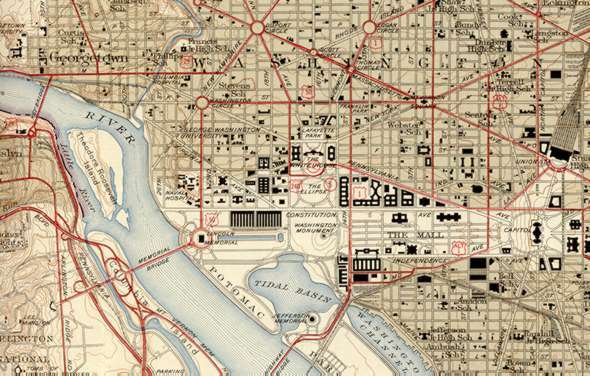 Later Connecticut Avenue and the trolley line were placed under the circle ending the confusion. Temporary office buildings were built on the Mall along Constitution Avenue between the Lincoln Memorial and the Washington Monument. These were used by government employees helping to support World War II efforts. They remained for some time after the war ended. To view a larger version of the above map click here. The map may take some time to download. Close that browser window to return here.